MANILA, — The USS Blue Ridge (LCC-19), the lead ship of the two Blue Ridge-class command ships of the United States Navy and command ship of the United States Seventh Fleet, has docked in Manila Bay as part of a routine visit. The ship’s primary role is providing command, control, communication, computers, and intelligent support (C4I) to commander and staff of United States Seventh Fleet. The Blue Ridge was commissioned 14 November, 1970 and its homeport is Yokosuka, Japan. 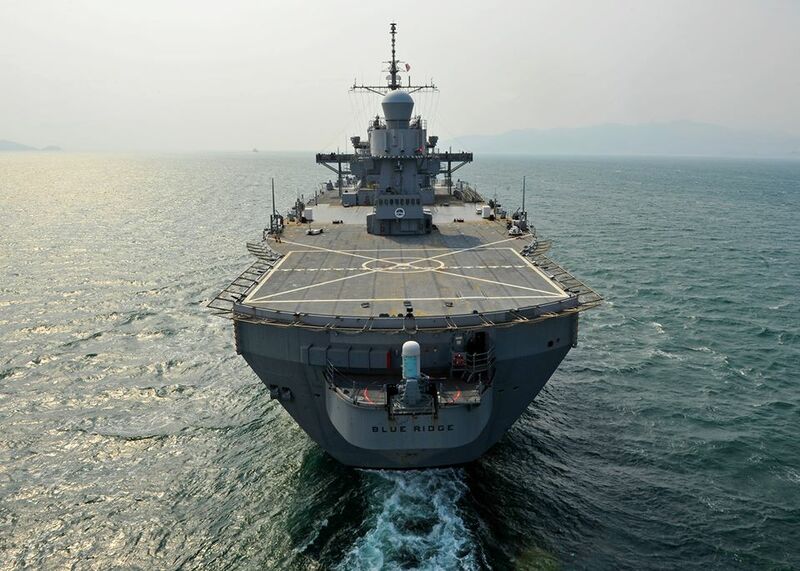 It is the third U.S. Navy ship named after the Blue Ridge Mountains and is the oldest deployable warship in the U.S. Navy. The USS Blue Ridge has a crew of more than 2,200 personnel and has participated in such operations as Operation Eagle Pull (1975), Frequent Wind (1975), Desert Shield and Desert Storm, and Operation Tomodachi, which supported Japan in disaster relief following the 2011 Tōhoku earthquake and tsunami. The U.S. 7th Fleet flagship USS Blue Ridge (LCC 19) steams through the Tomogashima Channel as she departs Osaka, Japan Feb. 27, 2016.